Best Room in the House | "No matter where I serve my guests, it seems they like my kitchen best." I found a great recipe for vegetable and cheese cannelloni a few weeks ago and it called for fresh ricotta. Not wanting to hunt all over for the expensive and elusive fresh ricotta (quite different and better than the ricotta you can find in any grocery), I decided to make my own. By the way, I will provide the cannelloni recipe another day. It’s great. For safety reasons, the milk needs to be heated to at least 185 degrees, Fahrenheit. I poured the whole milk into a heavy-bottomed stainless steel soup pot to which I added a cup of heavy cream and a tablespoon of salt. Using a candy thermometer attached to the side of the pot, I slowly heated the mixture, stirring nearly constantly, until the milk simmered, steamed and reached 190-200 degrees. For a gallon of milk, this took about 15 minutes on my electric stove. At that point, I turned off the heat, and stirred in 6 tablespoons of lemon juice. Rather quickly, the curds and whey began to separate. After 5-10 minutes it was time to strain away the whey. There are a few easy ways to accomplish this without buying any cheese-making aparatus or using yards of folded over cheesecloth. I find the easiest way is to use a man’s cotton or linen handkerchief, clean of course, and rinsed with water, placed over a medium sized colander or strainer. I have also used a #4 coffee filter in a strainer, but it doesn’t hold a lot. The handkerchief is at least 12 inches square and easily fits in my large colander with the corners hanging over the rim of the colander. Whichever straining method is used, you must place the strainer over a bowl large enough to catch the hot whey. You will have much more whey than cheese and if your bowl isn’t large enough to hold it all, you will need a second bowl close by. You can also put the colander in the sink and let the whey go down the drain. (Remember that the curds and whey are very hot.) Carefully pour the contents of the pan into the colander or strainer. At this point, you can let it stand to complete the draining away of the liquid. This can take 30 minutes or so, depending on how dry you want the curds. You can hurry the process by bringing up the ends of the handkerchief, twisting them around to force the cheese to release more liquid. The ball of cheese will be hot for quite a while, so be careful if you use your bare hands to squeeze out the liquid. Once the draining is complete, you can scrape the cheese off the cloth and into a container. I usually let it cool an hour or so on the counter before refrigerating it. A gallon of milk will produce about 2 cups of cheese. Of course you can always make a smaller amount. If you don’t need that much for a specific recipe, the rest of the cheese can be flavored with some chopped herbs for a savory cheese spread for bruschetta or any other bread. You can also make a sweet cheese spread by adding honey; this would be good on biscuits. With no preservatives, the cheese must be refrigerated and used within 3 or 4 days. If you have milk that is nearing it’s expiration date, this is a great way to avoid wasting it. I have saved some of the whey and used it as the liquid for baking bread. It can also be used in soup recipes. The new season for the Farmers’ Market brought the beginning of a promising supply of tasty locally grown produce. Among the first delights were beautiful asparagus spears. 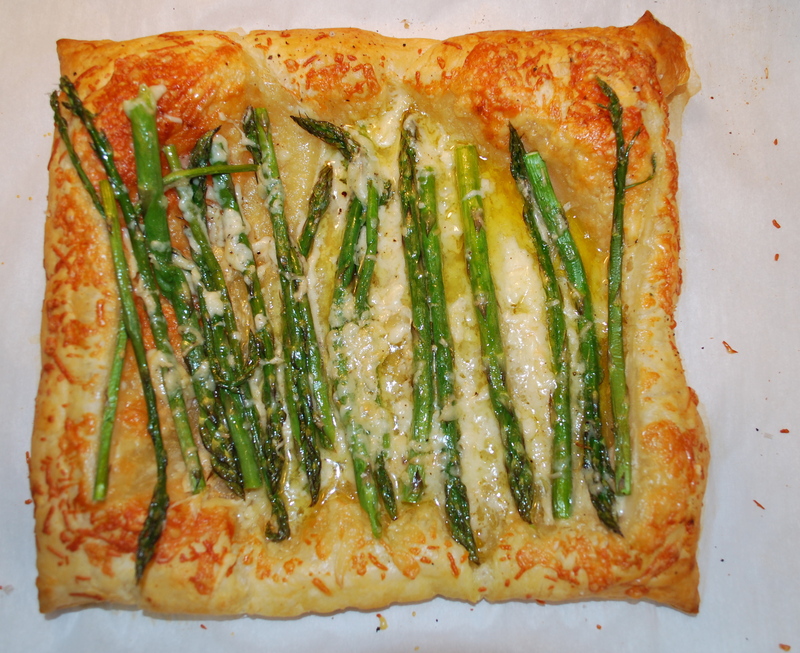 I used the first asparagus bundle to make the following asparagus cheese tart. The recipe originated on the “What’s Gaby Cooking?” website (http://whatsgabycooking.com). It’s simple, quick to prepare, and oh, so tasty! It’s also easily adaptable to your own cheese preferences and I made a few alterations to the original recipe myself. Give it a try before all the fresh asparagus is gone for the year. 2. Trim off 1 inch of the asparagus to remove the woody ends. Toss with 1 tablespoon of olive oil. 3. Thaw the puff pastry on a piece of parchment paper (about 30 minutes) until you can carefully unfold the two flaps. Roll out the dough slightly to seal the seams. Transfer the parchment paper and dough to a baking sheet. 4. Sprinkle half of the cheese onto the pastry. Line up the asparagus spears on top of the cheese. Sprinkle with the scallions or shallots if using. Scatter the rest of the cheese on top and sprinkle with salt and pepper. 5. Bake for 20 – 25 minutes until the pastry dough is golden brown and puffy and the asparagus is roasted and cooked through. Here in my part of the world it is nearly impossible to find hanger steak in our supermarkets. After years of reading about the tenderness and delicious flavor of this “butcher’s cut”, I was determined to find one to cook at home. I have seen it on the menu of Rue Dumaine, a wonderful restaurant near Dayton, Ohio, but I always chose a different item. My husband, however, did order it on two occasions and pronounced it wonderful. In my “recipes to fix someday” file – which will require me to live to 150 in order to accomplish – I had a few recipes for hanger steak, one for pan-roasting and the other for grilling. I split the difference and used the marinade for the grilled steak and the sauce from the pan-roasted steak. We had broccolini and browned butter mashed potatoes as accompaniments. For the marinade, I mixed a version of Chef Anne Burrell’s hanger steak recipe from the Food Network, some dijon, chopped garlic, a little rosemary, lemon juice and zest. I smeared it on the steak, bagged it up, and let it hang out in the frig for a couple of hours. When ready to cook it, I let it sit on the counter for a while to come to room temperature, then salted it, and got to work. For the sauce prep, I peeled and sliced 4 large shallots, put red wine vinegar and some dry red wine at the ready, and picked a few stems of parsley from the garden. The sauce recipe is from Daniel Boulud’s Cafe Boulod Cookbook via Epicurious. The broccolini (a cross between broccoli and kale, I believe) is a little daintier than broccoli and maybe a little milder in taste. It takes just a few minutes to steam and we like it sprinkled with a little Parmesan or Asiago. I delegated the mashed potatoes preparation to my husband. I had already browned some butter (slowly and stirring nearly constantly) and set it aside.All he had to do was peel and cut the potatoes, cook them and mash them up with some of the browned butter, buttermilk and whole milk, salt and pepper. He drizzled the rest of the butter over the finished product. I must admit that the red wine reduction renders the sauce a very dark, almost chocolate color, which some might find off-putting. The taste more than made up for it, I assure you. Remember to cook the steak to medium-rare at the most! I understand that hanger steak, very tender at rare and slightly beyond, can become tough if cooked to well done. Slice it against the grain and it will reward you with delicious, juicy tenderness and taste. Sam scored a bagful of jalapenos at the farmers’ market on Saturday with dreams of a get-together chowing down on jalapenos stuffed with cheesey goodness and wrapped with bacon. We chatted with Alex and decided that nachos and mojitos would be good accompaniments and so it was on for tonight. While we were waiting for the jalapenos, we prepared the nacos. A nice, thick layer of taco chips on a half sheet pan, topped with cooked and drained ground beef, refried beans, diced canned green chilies, dollops of sour cream, grated jack and cheddar cheese, minced onion, and into the oven for 15 minutes at 350, until the cheese is melted and the whole thing is hot and too tempting for words. We dug into those babies and made short work of them, washing them down with a second mojito. Love those more than margaritas. They are the only reason I grow mint. Of course, I wind up using the mint in other ways, but in the spring when I plant my herb garden, I think of mojitos and make sure to get a nice and healthy mint plant. (Be sure to plant mint in a pot, not in the garden, or it will take over. You will have mint enough for mojitos for everyone in the neighborhood. What a nice evening it was. Kids and dogs running around, adults enjoying adult food and beverages, the weather pleasurable, and the end of summer fast approaching. I hope your Labor Day holiday had at least one day as great as today was for us. While checking out some foodie blogs the other day, I ran across this tempting recipe for soup. Quick preparations and handy ingredients prompted me to make this yesterday for lunch and I’m here to tell you that it was well worth the effort. It is a timely soup for us now; the end of summer approaches and the local farm markets are offering the bounty of nature. We have oodles of tomatoes, peppers of all colors, and more squash than we can handle. The corn has been great and if you’re lucky enough to have a few ears on hand (or a can of corn in the pantry) give this a try. It’s from “locallemons.com” – that’s local lemons. My apologies to the “locallemons.com” people for altering their recipe to suit my needs and whims. Now, here are my notes. First of all, it makes a small amount, about enough for 3 large-ish servings. If you’re feeding a crowd or aiming for leftovers, you’ll have to double or triple the recipe. Second of all, be sure to read it all first. You must roast the peppers, first in order to skin them and render them a little tender. This is easy if you have a gas stove or grill but takes a little longer with an electric broiler unless you have one that gets blazing hot in no time flat. I don’t. But anyway, it should be no problem to get the peppers roasting while you prepare everything else. Thirdly, you need to roast garlic and have 2 1/2 tablespoons available. I didn’t have time to do that; I was starting this at nearly 11:00 and wanted to eat at noon. No time for garlic to roast. I improvised by sauteing the garlic with the onions at the beginning. I imagine that roasted garlic would give its own unique flavor to the dish, but I didn’t miss it. Next, I added about a cup of chicken broth with the tomatoes. Why? I don’t know. It just seemed like the thing to do. Lastly, the recipe calls for jalapenos, which I didn’t have on hand. I used a sprinkling of crushed red pepper to give the soup some added heat. Jalapenos, of course, add flavor as well, so I had to go without that. I found that the poblanos leant more that enough peppery flavor, but if jalapenos float your boat, go for it. I guess this demonstrates my philosophy of not letting a missing ingredient get in the way of trying a new recipe. There are exceptions, of course. Baking usually requires strict adherence to the ratios of ingredients, if not the exact amounts. But to let the absence of shallots keep me from making a sauce when I have scallions would be a shame. I recognize the difference between the two and am usually able to reconcile the taste discrepancies. In this case, fresh corn would be perfect, but canned or frozen corn would hardly be taboo. In fact, I doubt if anyone could tell the difference in this soup, as rich and flavorful as it is. The end of the sermon. 1. Roast the poblano and jalapeno peppers under the broiler or over a grill until the skins are black and blistery. Let them cool for a while until you can handle them and slip off the skins,, remove the seeds and white veins and give them a rough chop. 3. Melt the butter in a large pot over medium heat. Cook and stir the onions until soft and add the raw garlic, if using raw, and cook another minute or two without browning the garlic. Add the tomatoes and continue to cook on medium heat. Now add the crushed red pepper flakes if you are using that instead of jalapenos. 4. Mash up the peppers in a mortar and pestle, a small food processor, or with a fork or other mashing type device until they somewhat come apart. We don’t want puree, here, folks, just a further breaking down of the cell walls. Scrape all this peppery goodness into the cooking pot. 5. Next crush the corn a tad and add the broken kernels and the corn juice into the pot as well. 6. Stir in the roasted garlic, if using, and add a little sea salt to taste. 7. Cook all this for 10 to 20 minutes until it reaches the consistency you like. You can add a little water or chicken broth to dilute it a bit if it gets too thick. 8. Sprinkle with cilantro and serve with a slice or two of avocado and a little drizzle of lime juice. We had toasted bread and some cheese with this for our lunch and decided this recipe is a keeper. Give it a try. It just tastes like summer in a bowl. Can you stand another recipe from me for potatoes gratin, scalloped, whatever you want to call it? You probably think that we have it for dinner every other night. Actually, in the interest of saving calories, fat grams, and carbohydrates from my waistline, we, or should I say “I”, restrict ourselves to just once every other month or so. It’s a frequent request from the man who lives here, the one who can eat all the calories, fat grams, and carbohydrates without affecting his waistline or cholesterol count. I, on the other hand, can feel the cholesterol count go up if I even think of cheese, potatoes, butter, milk, or cream in a single bite. Regardless of all that, I threw caution to the wind and prepared this delicious potato recipe a while ago and it was right up there among my favorite potato recipes. The addition of cabbage made it reminiscent of colcannon. If you’ve never tasted that Irish delight, try it next year on St. Patrick’s Day. The origin of this dish is from Food Network’s Tyler’s Ultimate Show. I halved the recipe for the two of us and still had a bit left over. Double it to serve 6 easily. Notes: I didn’t use the entire half head of cabbage; I used about a third. I also used regular bacon that I had on hand, about 4 slices. If I find myself without chives, I usually substitute some shallots, or scallions. To save calories and fat grams, use half and half or milk instead of heavy cream. Gruyere or cheddar could work instead of the parmesan, but the taste would be different. I have occasionally used regular cabbage instead of Savoy. 2. Fry the bacon; remove from the skillet when crisp, and drain on paper towels. 3. Add about 1 teaspoon of the butter to the bacon fat in the skillet; let it melt and add half the garlic and the cabbage. Over low heat, let the cabbage wilt slowly and mix with the garlic. Add the bacon back to the skillet along with the chives. Season with salt and pepper. Remove from the heat. 4. With the remaining butter, grease the casserole or gratin dish and set aside. 5. In a large bowl, combine the sliced potatoes, half of the cream (3/4 cup), half of the parmesan (1/2 cup), and the rest of the garlic. Season with salt and pepper and mix carefully with your hands. 6. Place about half of the potatoes in the gratin dish. Sprinkle with a little more parmesan. Spoon the cabbage on top and repeat the potato layer and sprinkle with the rest of the cheese. 7. Cover with foil and bake one hour. Remove the foil and bake another 30 minutes. Let stand about 10-15 minutes before serving. I’m not from the South but I sure do love me some grits! If you want to be more sophisticated, call it polenta, dahlin’. Mush, polenta, grits, cornmeal porridge, call it what you will. I don’t care. Just fix yourself some and enjoy it. Forget those little paper envelops of instant grits. Yuck. It’s easy enough to make it from “scratch”. Boil some water, whisk in the grits, stir, stir, stir, yawn, stir, stir, stir. See? Easy. Now I must confess – I am not that fond of plain old grits, no extra added ingredients. Give me some sausage gravy, some cheese, some bacon and eggs, then I’m happy to eat the grits. But I prefer them dressed up a little with some flavor cooked in with them. The star of the show of our traditional Christmas breakfast is a grits “souffle”, flavored with garlic and cheese, fluffy with beaten yolks and egg whites folded in, and topped with a crisp cornflake crispiness. Yum. Last night I fixed a pot of grits as a side dish for dinner. It was so simple and tasty that you just have to fix it. (It would be a great addition to a hearty breakfast, also.) The grits are flavored with Cheddar and Parmesan. This recipe is from the September, 2008, issue of Southern Living. Thanks, guys and gals. 1. Bring the water and salt to a boil in a 3 qt. saucepan. 2. Whisk in the grits; reduce heat to medium-low, and cook 5 – 6 minutes until tender. 3. Remove from heat, and stir the cheese and the butter. Season with salt and pepper to taste.